The Mt. Randal Loop is a combination of three trails and a shoreline walk that makes for a 4-mile trek and the best hike in this 1,952-acre park. This outing includes a bit of everything: a stroll along Lake Michigan, stretches through forests, knee-bending climbs up mountains of sand to sweeping views below. 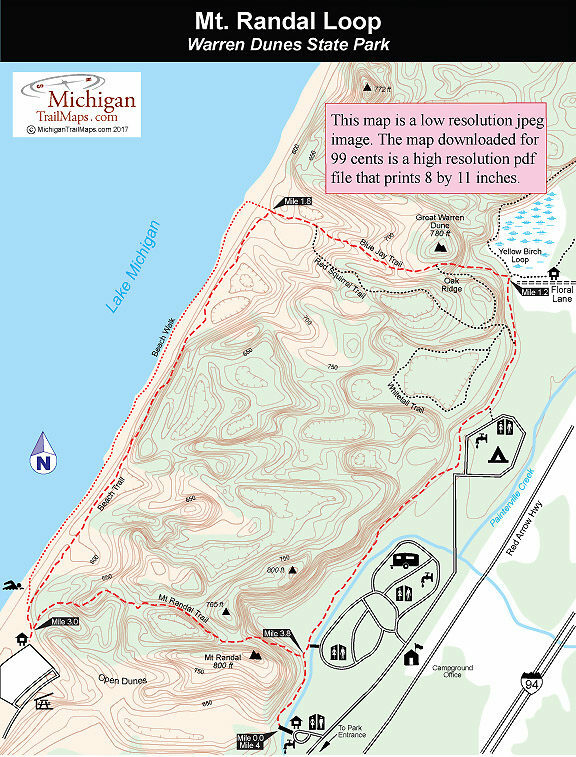 For visitors not familiar with Michigan’s dune country, the geology of this area can be intriguing. Along the hike you’ll be able to spot the different types of dunes from in this park: parallel dunes, blowouts, and parabolic dunes or parallel dunes that have been carved by a series of wind-blown indentations. To help understand the unique natural aspects of the area, a handful of interpretive displays have been erected within the park. 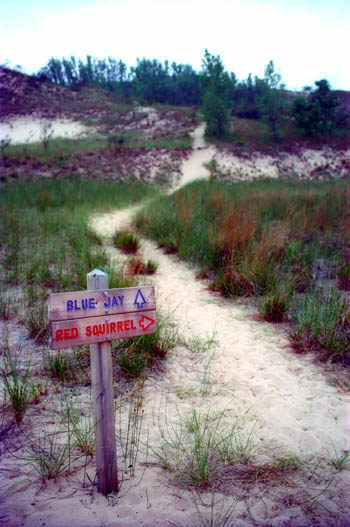 It’s important for hikers to understand that Warren Dunes’ close proximity to several major urban areas, including Chicago, results in the park having the second highest number of visitors of any state park. The vast majority are out-of-staters arriving from June to September. If you hike to sneak away from crowds and other signs of humanity, Warren Dunes is not the place to go on the Fourth of July. 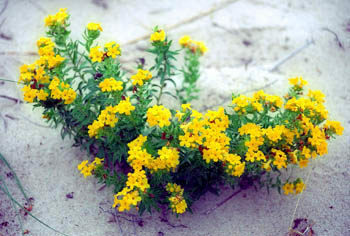 The best time to venture into the park is when the wildflowers bloom in April, or in mid- to late October when the leaves of the hardwood forests are touched with brilliant hues of oranges and reds. Arrive in mid-week during these off-season months and the crowds will be gone, the campground practically empty, and often you'll be the only one on a stretch of beach. If you are planning to arrive during the summer, the best days are Mondays and Tuesdays, the lull between the weekend crowds. By Wednesday the campground is filling up again, and Saturday there often are so many people at Warren Dunes that parking is almost impossible. If this is the case, avoid the main entrance and begin the loop off Floral Lane. Better yet, head north and explore Grand Mere State Park, saving this hike for another day. Also keep in mind that there are quite a few dunes to climb during the outing. Children under the age of six and others with weak knees might require more time than the normal two to three hours most people need for this hike. From the back of the parking area the Nature Trail crosses Painterville Creek and then heads north (right) reaching the junction with Mt. Randal Trail within a quarter mile. Along the way you’ll pass unofficial trails that head up Mt. Randal, the migrating dune that rises 220 feet above the lake and is literally pouring sand down between the trees, determined to bury the trail someday. At the junction Mt. Randal Trail heads west (left), continue north. Nearby, a footbridge crosses the creek to the campground, while the Nature Trail passes through a low-lying area. This area once held a pond, which was drained off by farmers in the early 1900s. Even though the interdunal ponds are gone, in the spring this stretch can still be wet and muddy. Painterville Creek swings out of sight, along with the campers on its east side. At Mile 0.8, you come to an old farmhouse foundation and what appears to be the end of a road. The rustic campground is nearby as is the junction for Whitetail and Red Squirrel trails. The Nature Trail continues along the former road and at Mile 1.2 reaches Floral Lane, where there is a trail map. To the north is the Yellow Birch Loop. Head west (left) on Blue Jay Trail to continue this hike and venture onto what is labeled on USGS Topos as Great Warren Dune. The trek to Lake Michigan begins in the woods but quickly climbs to the edge of a 200-foot open dune. A path leads to the top, but the trail actually skirts it along its south side. For the first time on the hike, you leave the forest and view the park's interior and all around you are dunes, some forested, others covered with grass, and a few just bare sand. On the horizon is Lake Michigan, and straight ahead is the sandy avenue that makes up the trail. Numerous paths, including posted Oak Ridge Trail, depart in every direction where hikers have wandered off to explore the park's backcountry. It's hard to get turned around, however. Just keep heading west, and at Mile 1.8, you will reach a low, sandy bluff above the beach. Here you have a choice. Beach Trail follows the undulating bluff above the shoreline, dipping and climbing around blowouts. Halfway back to the day-use area you cut across two fascinating blowouts that beckon you to climb their sandy slopes for a better view of the area. This is very interesting terrain but the hiking is harder and at times the trail is not well marked. The alternative, the one favored by most visitors, is to simply drop to the shoreline and follow Lake Michigan south to the day-use parking area. From the northwest corner of the parking lot in the day-use area, a "Foot Trails" sign can be seen on the edge of a wooded dune. This marks the Mt. Randal Trail and begins with an immediate climb into the hickory-oak forest. In early spring and late fall, you never lose sight of Lake Michigan in the first half mile, and you can usually hear the surf anytime of the year. The trail tops off at a spot many believe to be Mt. Randal, comes within view of the back side of a blowout that was crossed earlier, and at Mile 3.6 arrives at a bootprint marker. The sign directs you down a log staircase, then more boots keep you descending a steep trench between Mt. Randal and the next dune. Just when you think the trail is going to head into a low-lying wet area, it skirts Mt. Randal and breaks out near the footbridge to the park's campground. Backtrack south (right) along the trail to return to the parking area and trailhead. Within the trailhead parking area are vault toilets, picnic tables, and a water pump. This hike begins at the main trailhead, located north of the park headquarters along the park drive just before entrance to the modern campground. Contact the Warren Dunes State Park headquarters (269-426-4013).